China PMI Plunges To 3 Year Low. Equity markets soared on central bank manipulations and various rumors the past few days. However, neither rumors nor trivial actions (which is all that happened) can save the global economy. Yesterday stocks rallied on news China Cuts Bank Reserve Ratios by .5 Percentage Points and Central Banks Cut Rates on Dollar Swap Lines. However, the reason Chinese central bank reacted is hugely deteriorating conditions in China. The reason the Fed reacted is hugely deteriorating conditions in Europe. Equities have rallied on reported “good news”. However the first irony is the global economic picture outside the US is horrendous. The second irony is bottoms are formed on bad news (and tops on good news), but central banks intervention is really bad news widely recognized as good news. 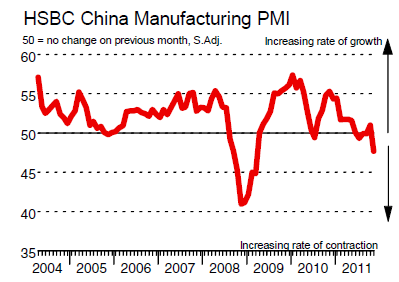 With that in mind, please consider the HSBC China Manufacturing PMI for November 2011. November data showed Chinese manufacturing sector operating conditions deteriorating at the sharpest rate since March 2009. Behind the renewed contraction of the sector were marked reductions in both production and incoming new business. The latest survey findings also showed a marked easing in price pressures, with average input costs falling for the first time in 16 months. In response, manufacturers reduced their output charges at a marked rate. After adjusting for seasonal variation, the HSBC Purchasing Managers’ Index™ (PMI™) – a composite indicator designed to give a single-figure snapshot of operating conditions in the manufacturing economy – dropped from 51.0 to a 32-month low of 47.7 in November, signalling a solid deterioration in manufacturing sector performance. Additionally, the month-on-month decline in the index was the largest in three years. Manufacturing production in China fell for the first time in four months during November, with the rate of decline the fastest since March 2009. Panelists generally attributed reduced output to falling new business. The latest decline in new orders was marked, and the steepest in 32 months. Moreover, the month-on-month decline in the respective index was among the greatest since data collection began in April 2004. Stocks ignoring bad news is normally a very good sign. Stocks rallying on government intervention as bad news is presented as good is a different story indeed. From Mish’s Global Economic Trend Analysis: China Manufacturing PMI Plunges to 32-Month Low of 47.7; Reflections on Stocks Rallying on “Bad News”. Mike Shedlock / Mish is a registered investment advisor representative for SitkaPacific Capital Management. Sitka Pacific is an asset management firm whose goal is strong performance and low volatility, regardless of market direction. Visit Sitka Pacific’s Account Management Page to learn more about wealth management and capital preservation strategies of Sitka Pacific. You are currently viewing my global economics blog which typically has commentary every day of the week. I am also a contributing “professor” on Minyanville, a community site focused on economic and financial education. Every Thursday I do a podcast on HoweStreet and on an ad hoc basis contribute to many other sites.